Flight prices for Labor Day 2018 are the cheapest they've been in four years. Now is the best time to buy, with domestic round trip prices for Labor Day Weekend (Friday, August 31 - Monday, September 3) averaging $255. Prices will slowly start rising this week, but buy before August 17th - prices will increase $10 to $15 a day in the two weeks leading up to Labor Day Weekend. If you have flexibility, you can save the most money by leaving on Saturday, September 1 and returning Wednesday, September 5. The Southeast will have some of the best bargains this year, with cheap flights to Fort Lauderdale, Orlando, Myrtle Beach, and Atlanta. 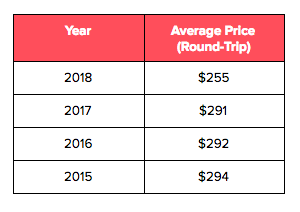 Compared to previous years, round-trip flight prices for Labor Day Weekend 2018 are the cheapest they've been in four years, and down ~14% from last year. Prices this year are tracking slightly below last year's Labor Day Weekend, but following a similar pattern. 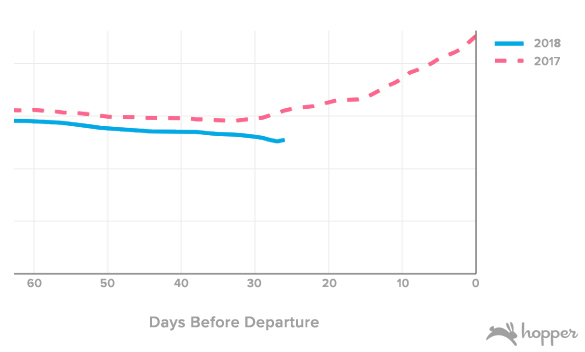 We appear to be near the inflection point of around 25 days before departure, after which prices are expected to begin rising. We expect this pattern to hold with moderate increases of ~$3 a day over the next week, before a rapid increase in the two weeks immediately before the holiday. As expected, Friday, August 31 - Monday, September 3 are the most expensive dates for the Labor Day holiday. However, you can save the most money by leaving on Saturday, September 1 and returning later in the week, between Tuesday, September 4 and Thursday, September 6. Don't want to travel on Saturday? You can also save by shifting your departure to earlier in the week, with big discounts for Tuesday, August 28 and Wednesday, August 29. 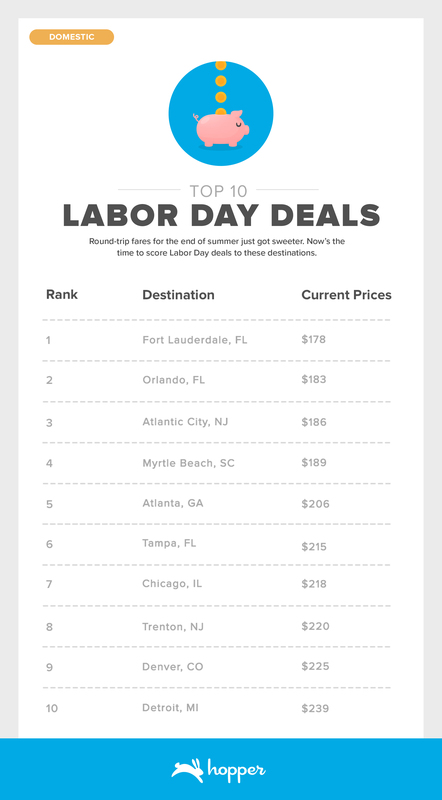 Cities in Florida and the rest of the Southeastern coast have some of the best prices. However, you can also look to Chicago or Denver as affordable destinations outside the Eastern region. The data utilized for this study comes from Hopper's real-time "shadow traffic" containing the results of consumer airfare searches. Hopper collects, from several Global Distribution System partners, ten to fifteen billion airfare price quotes every day from searches happening all across the web.